Morris LED vaporproof ceiling light fixture for many types of general lighting needs. These are rated at 10 watts and are used in many harsher environments like industrial or agricultural. Wherever you have water mist in the air or direct spray, these fixtures will hold up to what you can dish out. They can be directly sprayed for clean up for foodservice, brooders, industrial types of lighting applications. 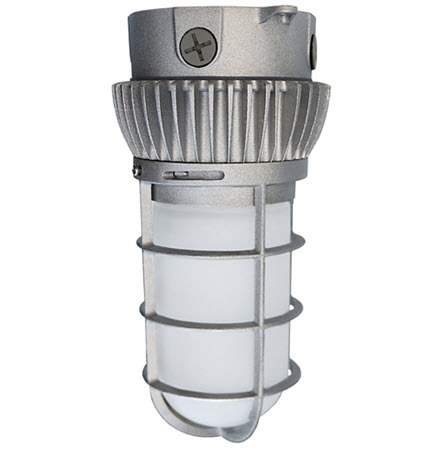 This is the classic designed for vapor proof light fixtures only upgraded to more efficient LED technology. If you have any area where you want to keep the lights from any water getting in them, then this will work for you as well. There are more applications that can probably be mentioned because moisture is a problem for many types of outdoor and indoor interiors. It's also nice to have the aluminum structure around the light source so that anything bumping it will not break the glass. You also get the benefit of a lower starting temperature, so these can be used in some very cold locations such as walk-in and freezers and refrigerators.